Sallan takes a first glimpse of a future underground. 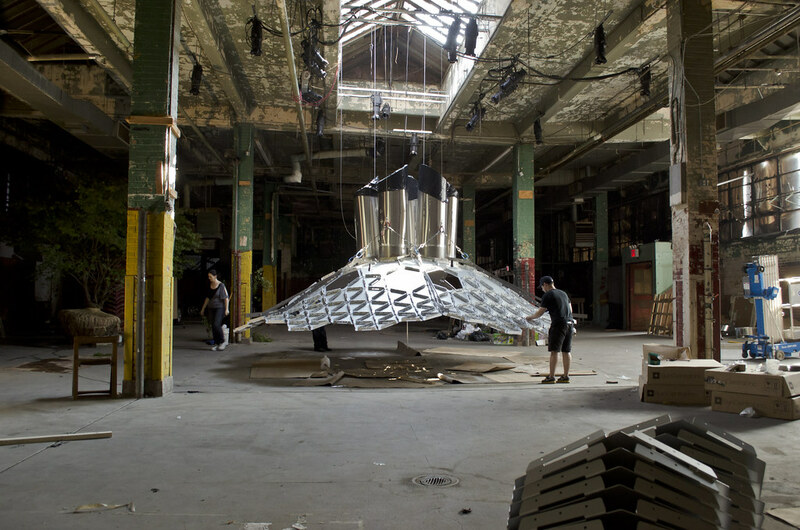 The shuttered Essex Street City Market is hosting an installation to introduce the Lowline. The brainchild of James Ramsey and Dan Barasch, the Lowline is envisioned as a year round public space in an abandoned 1.5-acre trolley terminal that runs under Delancey Street. Built in 1903, the terminal was a place where trolleys that completed their Brooklyn to Manhattan run over the Williamsburg Bridge turned around for the return trip, but this cobblestoned terminus was left derelict in 1948. The Lowline installation includes computer generated graphics of Manhattan traffic flows by Experiments in Motion and Columbia University student projects for 21st century underground mobility enhancements. But the biggest attraction is found in a vast, dark, curtained-off space where light bounces off a curvy panel system onto an islet composed of a tree on a mossy mound where mushrooms grow on scattered logs. Above, the solar distributor canopy consisting of 600 unique laser-cut light-reflecting aluminum panels is suspended from the ceiling. These panels diffuse sunlight brought into the space through a tube containing special fiber optics. The light tube gathers and concentrates sunlight collected on the building roof and can transmit it for a 100 feet. Enough light enters to allow plants that grow on forest floors to thrive in underground New York City spaces. Close your eyes and think of other urban locations that would benefit from becoming irrigated with sunlight. What do you see? Subway platforms, underground concourses, garages and basements take on a whole new look. Suddenly, prospects brighten for all kinds of subterranean spaces. What a value proposition! Originating 93 million miles away, sunlit urban interiors now could be in easy walking distance. Greenemeier, Larry. "Tunnel Vision: Subterranean Park to Stay Sunny with Fiber-Optic Skylights [Slide Show]." Scientific American, 14 Sept. 2012, www.scientificamerican.com/slideshow/lowline-park-green-space-nyc/ . Howarth, Dan. "New York Gives Thumbs up to Subterreanean Lowline Park." Dezeen, 30 May 2018 www.dezeen.com/2016/07/14/new-york-approves-lowline-underground-park-lower-east-side-manhattan/ . The Lowline Story from The Lowline on Vimeo. The content on this page originated as content published using the Storify platform — unfortunately, Storify was no longer available after May 16, 2018. Content was exported from Storify and then re-embedded onto the Sallan website. In some instances, Sallan took the opportunity to revisit Stories updating them with additional content.